Purée enough watermelon to make 3 cups of strained, pulp-free watermelon juice. Sprinkle three packets of unflavored gelatin (a packet usually contains ¼ oz. ) in a glass. 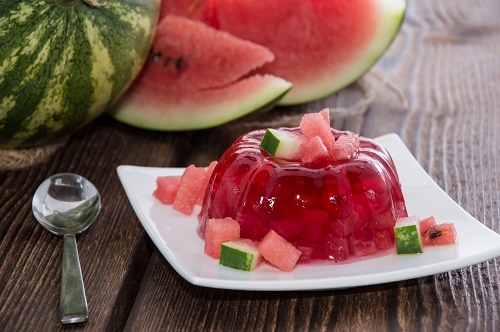 As you let the gelatin get to work, pour the other two cups of watermelon juice in a saucepan, mix in ½ cup of sugar and warm over low heat until the sugar dissolves. Add in the gelatin mixture and ¼ cup of lemon juice before you turn off the heat. Pour into a dish and leave in the refrigerator overnight. By morning, you should have a sparkling, wobbly and fun jelly to serve.